Senior southpaw Kevin Hodgson adjusts his hat during a baseball game against Towson Wednesday. Baseball bounced back after dropping its series opener against Dayton – routing the Flyers in the final two games of the weekend and earning its third-straight series win. GW’s 15–9 loss to the Flyers Saturday was overshadowed by a 9–2 win later in the day and a 17–2 blowout Sunday. The Colonials (15-12, 5-1 A-10) have now won eight of their last nine outings. During the weekend, they were carried by their bats, racking up a combined 44 hits while limiting the Flyers (7-15, 1-2 A-10) to just 25. GW struggled at the mound in the first game of the series, giving up five home runs in the 15-9 loss. Sophomore pitcher Jaret Edwards let up two runs before being replaced in the bottom of the second inning by junior southpaw Pat Knight. Knight gave up five runs on three hits in four innings of work. 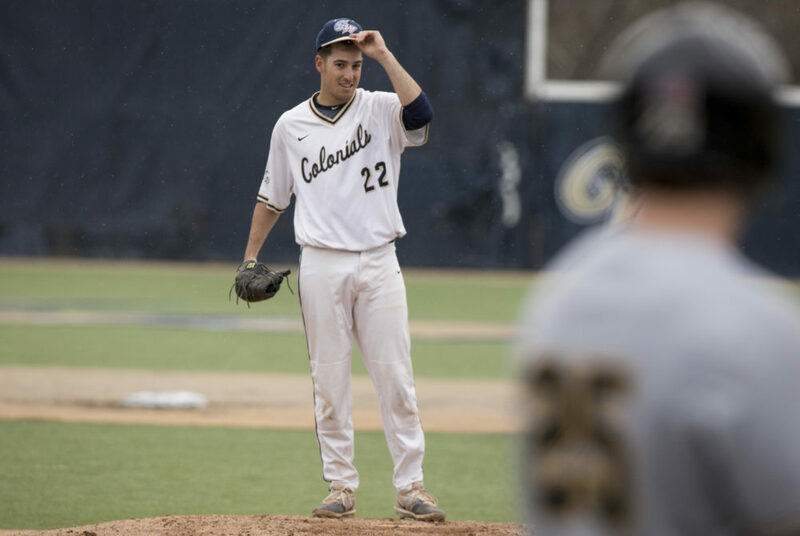 Despite the pitching struggles, three Colonials – senior third baseman Isaiah Pasteur, junior utility player Dominic D’Alessandro and senior shortstop Robbie Metz – hit home runs in the game. Pasteur went deep in his first at-bat in the top of the first inning to give GW a 1-0 lead. But the Colonials lead was short lived, as Dayton junior outfielder Pat Meehan answered back with a two-run home run in the bottom of the first. Both sides went back and forth through the middle innings, and Metz’s two-run home run in the top of the fourth inning put GW ahead 7–5, but Dayton’s offense continued to respond. A five-run inning for the Flyers in the bottom of the eighth solidified their win. Still, the Colonials racked up two more hits than the Flyers in the game. GW rallied back in the second game of the doubleheader, reaching base on 12 hits and downing the Flyers 9–2. The Colonials pitching staff, led by sophomore pitcher Elliott Raimo, held Dayton to five hits on the afternoon. “They hit a lot of home runs in the first game so we just kind kept the ball down and in the zone and got ahead early and threw more strikes,” Raimo said. Osis opened the game with a two-run homer in the top of the first and notched his second long ball of the game in the seventh. Doubles from Pasteur and redshirt freshman outfielder Colin Brophy in the top of the second continued GW’s offensive push and earned the Colonials two more runs. An RBI double from D’Alessandro scored one Colonial and increased the team’s lead to 6–1 in the third inning. The Flyers picked up their final run of the game when redshirt sophomore Brandon Smith hit an RBI double. The Colonials won the rubber match in dominant fashion Sunday, routing the Flyers 17-2 by scoring in all but two innings. But the Flyers struck first, when an error and a stolen base put Meehan in scoring position in the first inning. A bunt by Dayton junior outfielder Connor Echols allowed the runner to score and gave the Flyers their only lead of the day. Three frames later, the Colonials cracked the game open when they picked up seven runs in the top of the fourth inning. Sophomore infielder Nate Fassnacht hit a double to advance Osis to third base. An RBI base hit from senior outfielder Matt Cosentino then sent Osis home, and a double from D’Alessandro pushed Fassnacht over the plate. A three-run home run from Pasteur – his team-leading eighth of the year – extended GW’s lead and Osis knocked in two runs on a double before the inning’s final out was recorded. Dayton scored one final time in the forth inning, but GW’s hitting spree did not conclude. The Colonials picked up an average of two runs per inning for the final four innings of the game. “We came back and we continued the offense in the second and third game and we took the back the end of the series,” D’Alessandro said. The Colonials travel to William and Mary Wednesday for a 3 p.m. contest against the Tribe.